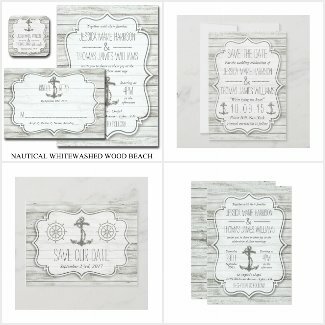 This nautical whitewashed wood beach wedding invitation and stationery suite is a gorgeous way to invite friends and family to your beach or beach-themed wedding. visiting this page, we may receive a small royalty which never costs you anything extra. The background of this delightful design, on the front and back, looks like whitewashed wood. There's an image of a ship's wheel on the one side and a white shield design that houses all of the details of your wedding along with a ship's anchor. The entire design is done in monochrome gray and white giving it a sophisticated feel while keeping it light and casual. There is a HUGE selection of matching stationery pieces to this set which can all be purchased separately. ​As stated above, this design is perfect for a beach wedding but can also be used for a nautical-theme wedding, a wedding being held on a ship, or simply a summertime wedding being held in the backyard for two people who love sailing. If you're a couple of "boat people" who love the wind in your hair and the sun in your eyes, this delicious design would be the perfect way to reflect that on your wedding day! Don't miss our other featured summer wedding stationery collections. ​All of our featured invitation collections are brought to you by the artists who keep shop at Zazzle.com, a world leader in custom and personalized paper, apparel, home decor, and gift items. You'll be happy to know that everything sold at Zazzle comes with a 100% satisfaction guarantee. 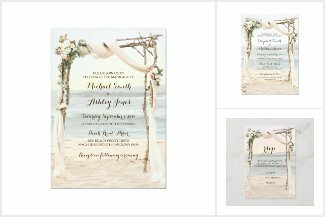 If you're getting married on the beach this summer, or if you're having a destination wedding at a beach at any time during the year, you need to see this gorgeous wedding invitation suite. The design on the front features an image of what looks like a romantic driftwood wedding arbor constructed on the sand in front of the beautiful blue ocean water. The arbor has flowers strewn through it and delicate fabric wound around the wooden base. The back of these stunning wedding invitations has an image of a heart drawn in the sand with your initials written inside of it. This is the perfect wedding invite for anyone planning a casual beach wedding. Weddings on the beach are so romantic yet they're usually very casual with some brides even opting to wear barefoot sandals with long flowing skirts. Your guests can wear comfortable clothing as well and everyone seems to be a bit more relaxed. I was lucky enough to attend a beach wedding once and there's just something special about hearing the crashing waves and the sea gulls cawing in the background that's so good for your soul. I love the salty scented air and the feeling of the sand between my toes. The seashore is definitely my happy place and if I were to do it over again, I'd be sure to plan my wedding at the beach. I can't think of a happier place to wed. There are more items in this romantic beach arbor wedding stationery collection. All of the wedding stationery and invitations that we feature here are brought to you via the artists who keep shop at Zazzle.com, a world leader in custom and personalized paper, apparel and gift items. You can choose the size, shape and paper stock for your wedding invitations, Pricing will be determined by your choices. Personalizing is always free and your purchase is backed by Zazzle's 100% satisfaction guarantee. We're featuring gorgeous wedding stationery collections for your most romantic day!